Admiral of the Fleet, last Viceroy of India, Prince Philip’s uncle and a rampant self-publicist, Louis Francis Albert Victor Nicholas, 1st Earl Mountbatten of Burma, KG, GCB, OM, GCSI, GCIE, GCVO, DSO, PC, was born at Frogmore House, Windsor, Berkshire in England, at 6am on 25 June 1900. On 18 April 1955, he was appointed First Sea Lord. On 30 April 1959 he became Chief of the Defence Staff, a job he held for six years. Mountbatten spent much of his declining years ensuring the preservation of his own legacy. Mountbatten usually holidayed at Classiebawn, his summer home in Mullaghmore, County Sligo, a small seaside village on the far north west coast of Ireland. By 1971, 12 policemen were on duty “in case the IRA try to take me as a hostage”. In 1974 Sir Robert Mark, the commissioner of the Metropolitan Police Force, said that he would prefer Mountbatten not to go to Ireland. That year 28 policemen were assigned to protect Mountbatten. As each year went by the danger for Mountbatten seemed to pass. In 1979 he was nearly 80 years old and had not had any real power for 14 years. At 11.30am on 27 August 1979 Mountbatten and his party climbed aboard their 9-m (29-ft) long fishing boat Shadow V. Mountbatten was accompanied by his daughter, Patricia, son-in-law, Lord Brabourne, twin grandsons, Nicholas and Timothy, their grandmother, the 83-year-old Doreen, Dowager Baroness Brabourne, and a local boy, Paul Maxwell, a 15-year-old Protestant from County Fermanagh. The boat, steered by Mountbatten, raced to the first of the lobster pots, the point of the expedition. Before he could cut the engine, a 23-kg (50-1b) bomb blew the boat apart. It appeared that the device had been activated remotely from the shore. Mountbatten died immediately, as did his grandson, Nicholas, and Paul Maxwell. Doreen Brabourne died of her injuries the following day. At 9.40am on the day of the assassination police had stopped a car containing Thomas McMahon and Francie McGirl for a routine tax disk check. The driver, Francie McGirl of Ballinamore, County Leitrim, gave a false name to police. Shortly before noon, while both men were being questioned, Shadow V was ripped apart by an explosion activated by a timer. 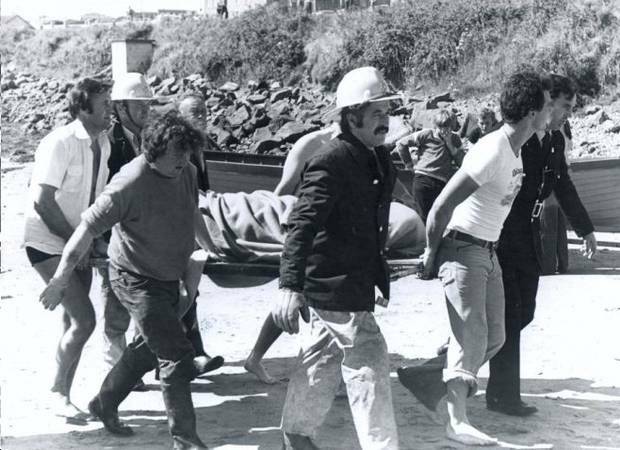 When McGirl said, “I put no bomb in the boat”, the Irish police knew that they had caught the assassins. Thomas McMahon and Francie McGirl were tried for the murder. McMahon was convicted on 23 November 1979, McGirl acquitted. McMahon was released in 1998 under the terms of the Good Friday Agreement. McGirl died in a farming accident in 1995.